On October 29, Marc Marquez (Repsol Honda Team RC213V) finished 4th in the Malaysian Grand Prix, giving Honda a sufficient points-lead to take the constructors’ crown for the second year in a row, with one race, Valencia, remaining in the season. Each race in the constructors championship, bike manufacturers are awarded points equal to their best rider’s result. The title is determined by the total points earned. Honda’s title was won by the combined efforts of Repsol Honda Team’s Marc Marquez and Dani Pedrosa on Honda factory bikes, and LCR Honda’s Cal Crutchlow. 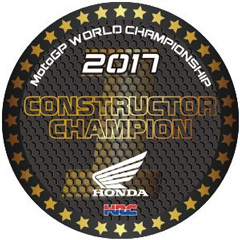 Since winning its first premier class title in 1966 on a 4-stroke 500cc Honda RC181, Honda has won a total of 23 constructors titles.